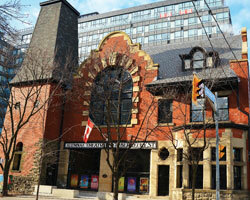 The Alumnae Theatre Company is celebrating its 100th birthday and you’re invited On Sunday, September 16, the oldest theatre in Toronto is holding an Open House for friends, family and neighbours, at the old Firehall No.4 at Berkeley and Adelaide. Come visit us at 70 Berkeley Street, from 1 – 4 pm. The entire theatre will be open, from the lobby to the backstage, the wardrobe department to the carpentry workshop, so you can see what goes on behind the scenes at a working theatre. And there’ll be various forms of stagecraft, including costume demonstrations, plus music, popcorn, refreshments and excerpts from some of the most entertaining plays of the past century. And who knows? Maybe one of our ghosts will put in an appearance. Hope to see you soon.